Known for its clear, straightforward writing style, grounding in current research, and well-chosen visuals and examples, Sigelman and Rider's text combines a topical organization at the chapter level and an age/stage organization within each chapter. Each chapter focuses on a domain of development such as physical growth, cognition, or personality and traces developmental trends and influences in that domain from infancy to old age. Each chapter also includes sections on infancy, childhood, adolescence, and adulthood. The organization helps you grasp key transformations that occur in each period of the life span. Other staples of the text are its emphasis on theories and their application to different aspects of development and its focus on the interplay of nature and nurture in development. 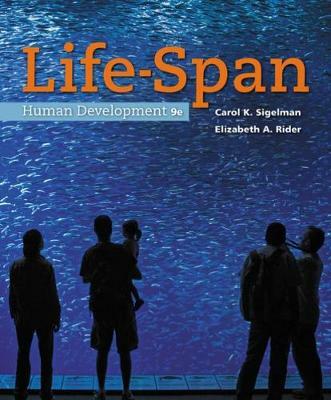 This edition includes new research on biological and sociocultural influences on life-span development and offers new media resources that help you engage more actively with the content.